Your body should be able to digest a greasy slice of pizza without causing problems. 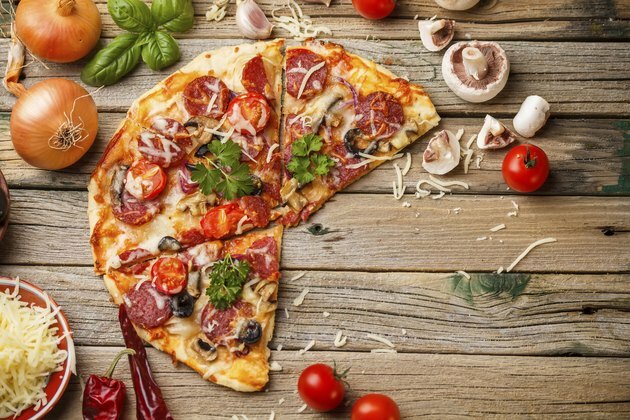 In some cases, though, pizza might give you diarrhea if your body has a difficult time handling some of the ingredients or if your slice is contaminated. If your symptoms continue for more than a couple of days or if you always have diarrhea after eating pizza, it's time to see your doctor. When your body doesn't have enough lactase -- the enzyme that breaks down lactose from dairy -- you could have episodes of diarrhea after consuming a food that contains milk-based products such as cheese on pizza. If you're lactose intolerant, you'll usually become gassy, feel bloated, have belly pains and may even feel nauseated after eating a dairy food. Symptoms can begin from 30 minutes to up to two hours after eating, according to the National Digestive Diseases Information Clearinghouse. If you're allergic to one or more ingredients in your favorite splurge food, this could cause diarrhea. Dairy, wheat and shellfish are a few of the common allergens that can be linked to ingredients found in pizza. If you notice a rash on your skin, have a runny nose or if your eyes become red and watery, it's a sign that you might be allergic to something in the pizza. If your tongue swells, if you have chest pains and difficulty breathing a few minutes after eating, these are signs of anaphylactic shock. Anaphylactic shock can be fatal if you don't get emergency treatment right away. Diarrhea is a typical problem associated with gluten sensitivity or celiac disease. With celiac disease, your immune system overreacts to gluten, which is a protein in wheat, barley, rye and in products made with these grains. If you have celiac disease, continuing to eat gluten-containing foods, such as pizza, can lead to intestinal damage. Over time, the villi that absorb nutrients in your intestines become destroyed, which sometimes leads to malnutrition. You could lose weight unintentionally if your system isn't absorbing nutrients, you could suffer from indigestion after eating or become constipated. Improperly handled food can become contaminated and lead to foodborne illness. This can happen if the meat on your pizza wasn't cooked to the proper temperature or if your fully cooked pie was cut on a surface that came into contact with undercooked meat or other contaminated food. Cooks who don't wash their hands thoroughly can taint your entree, as well. Under these conditions, bacteria or parasites get into the pizza, causing diarrhea. If you have a foodborne illness, you might be unable to control your bowel movements, experience cramping in your abdominal region or develop a fever. Sometimes, problems don't begin until several days after becoming infected.